Friday @the park. The dads & the boys had a jolly good time kicking the ball from one end of the goalpost to the other. 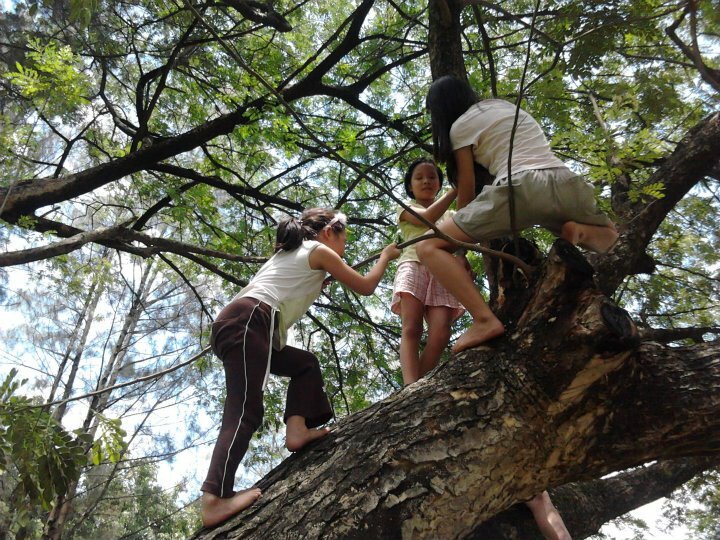 The girls preferred to play at the swing, play card games and eventually, the boys and girls decided to try their hands in climbing the big tree at the park! There was a lot of communication and hand-helping here. Very good day out! Letting the kids decide what they want to do at the park as opposed to planning the activities for them, really elicited a different kind of response from them. They are definitely more enthusiastic about coming and are more communicative with one another. Hanging out under a big tree was very nice – kids are talking, laughing, falling over….then someone climbed up, which spurred the rest to do so. Watch the video to see how the kids try so hard to go up. Some succeeded. Some didn’t. Someone decided to jump down instead to sliding down the tree trunk. Found out the painful way that that was not such a good idea after all. We all learn – we play, we try new things, we push ourselves, we fall, we feel the pain, we learn from them all….. Someone asked what program we have on Fridays. We say: Friday is fun at the park! Care to join us @ CLiC? This entry was posted in Activities, CLiC Activities, Outings and Networking Activities. Bookmark the permalink.